Kaminarimon retailer Katsuhiro Satomi has a very calm air. This may be to do with his youthful 70-plus years, and his family’s long history in the business – since his great-grandfather sold secondhand goods in the Meiji era. 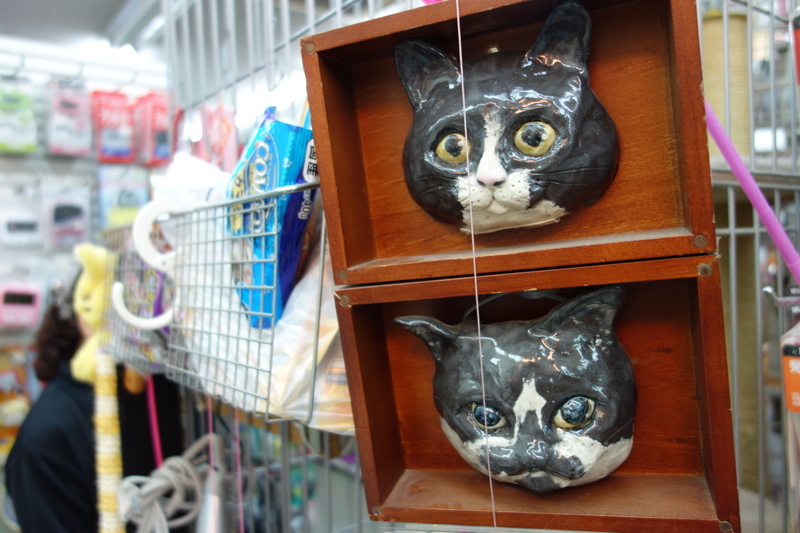 It could also be connected with the store’s two muscular cats, who emanate a sort of force-field, like power stones, as if they are supervising things. 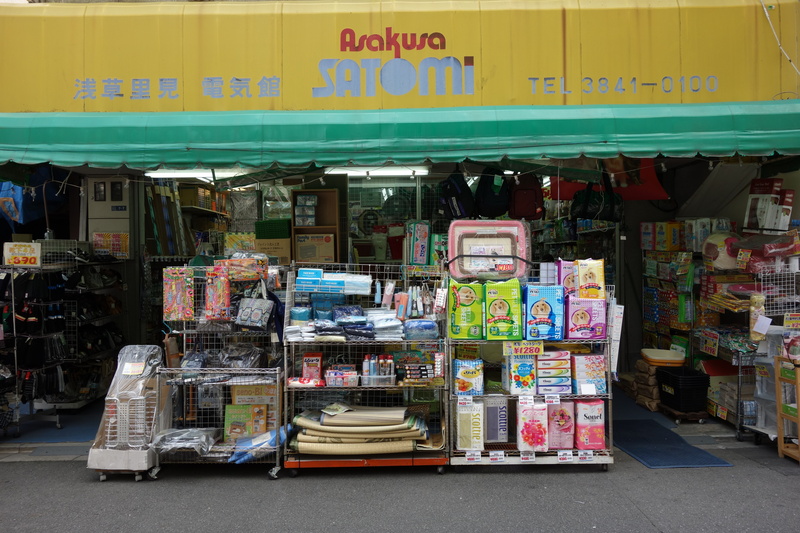 The store, which opened in 1953, is called Satomi’s Electrical House – or Satomi’s Pet House, depending on whether you read the sign on the yellow awning or the one on the side of the building. It’s hard to pin down what he sells. The range is unique: pet food, bicycles, electrical fittings, stationery and homeware. It’s like a miniature version of one of the super-discount stores. 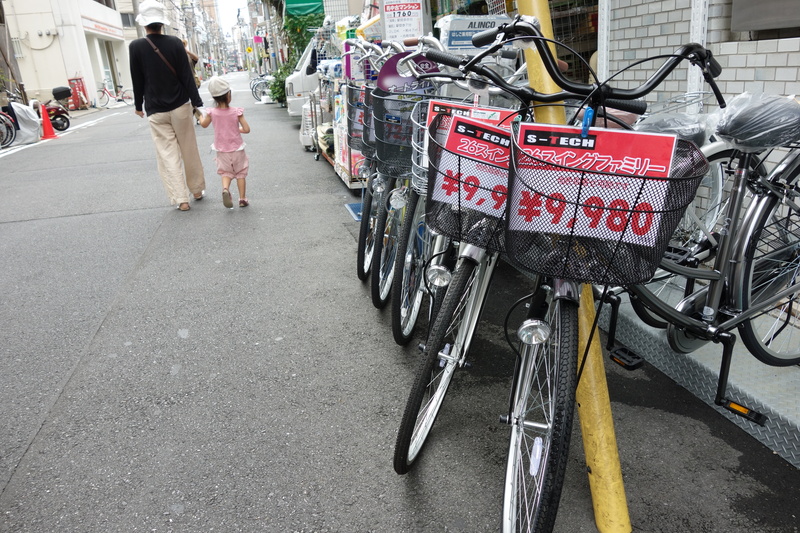 Satomi also has some great prices – mamachari bicycles for under 10,000 yen. But he can’t discount everything. Perhaps that’s where the calmness comes in. It’s part resignation. He’s a small neighbourhood operator selling electrical items and homewares in an age of giants like Yamada Denki, Drug Papas and all the others … not a bright prospect. 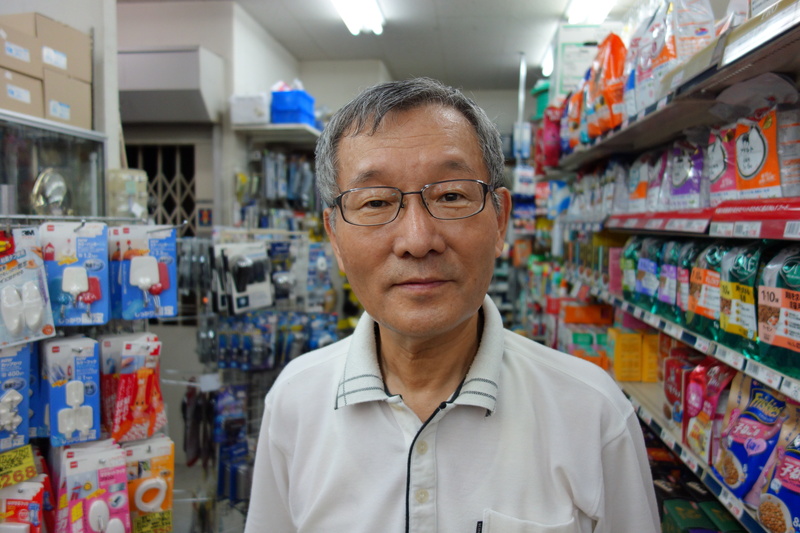 Until recently Satomi occupied the next-door building as well, but with economic conditions he’s given that up and now rents it out to a 7-Eleven. Satomi says, It used to be the big manufacturers like Panasonic and so on would set prices, and they’d be the same for all stores, but now lowest prices are set on the distribution side, by the big retailers with their economies of scale. We can’t compete. We can offer convenience to elderly people who can’t go far out of the neighborhood. That’s about it. Whatever the conditions, the chairman comes to work almost every day, although his son runs the day-to-day business. The chairman fixes bicycles, among other things. He looks after the cats, U-chan and Chibita, feeds them cat grass and makes sure they’re looking their best. He says, I put him in a pink bow today, it looks a bit cooler in this weather. Staff member Tsuyoshi Akino tells how U-chan was a stray who moved in behind the shop and gave birth eight years ago. That would seem like another lifetime – if the cat could remember it. She is now a 6-plus-kilo behemoth. Still catches the occasional mouse at night when she has the run of the store, but daytimes are spent reclining aristocratically on a cushion in a wire box in the centre of the shop. 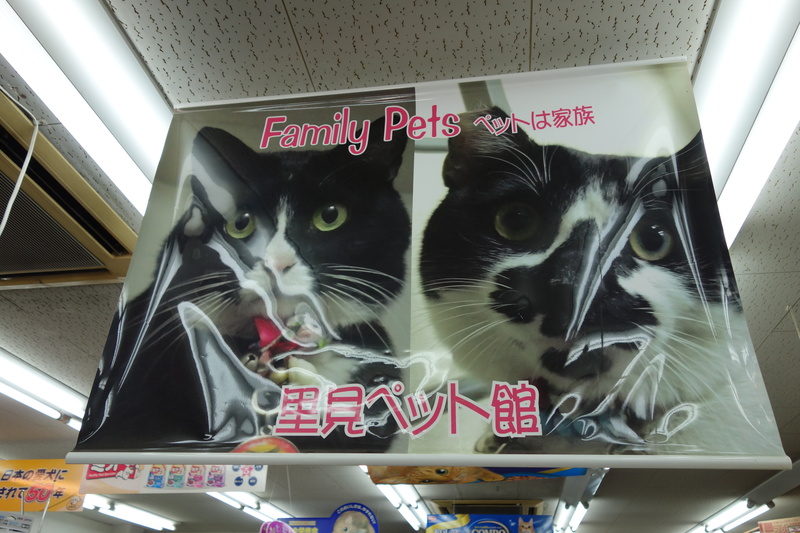 Together with Chibita – also a stray who came more recently – she is an in-store celebrity, with her face on posters, catfood packages, and even a clay relief portrait, made by a local ceramics maker and teacher who buys his pet food here. Satomi Pet House is like a neighborhood hub. People bring their pets as they come to shop or chat, or have Tsuyoshi adjust their brakes. 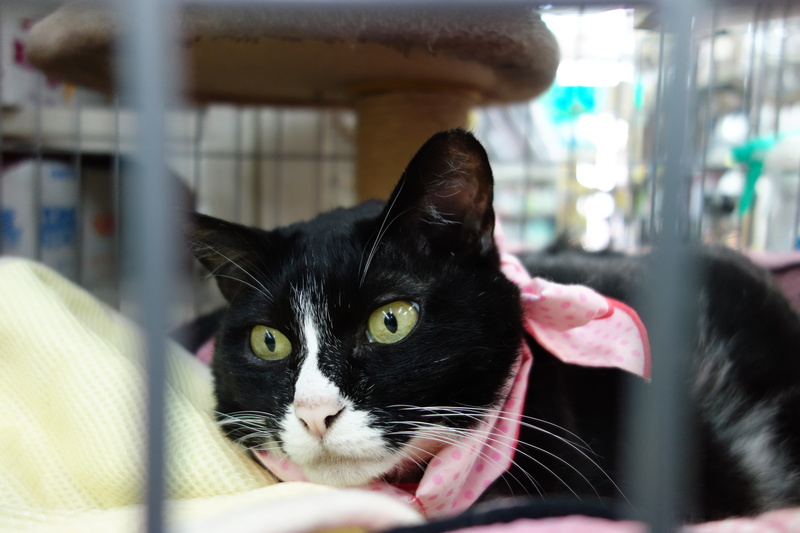 And lest you think U-chan’s less-than enthusiastic appraisal of you suggests a typical cat-like ingratitude, there is a 14-page booklet free at the cash register detailing her life, titled U-chan Says Thank You, although written by the chairman.